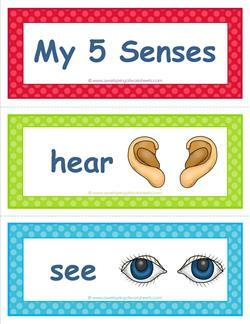 Here's a bare and basic set of five senses vocabulary cards. Use these as an art project for the kids. They'd look great colored in crayons or colored pencils! Make your own borders, too. 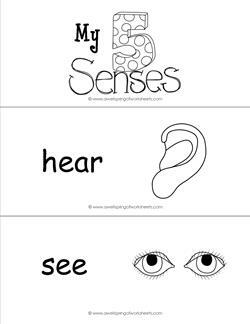 With beautifully illustrated senses and bright backgrounds, you've got no reason not to adopt these five senses vocabulary cards into your five senses lessons or unit! 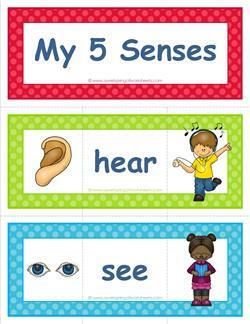 Each child in this set of five senses vocabulary cards is exemplifying a sense: listening to music, eating an ice cream cone, reading a book, petting a cat, smelling the flowers. 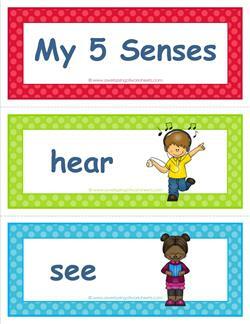 This set of five senses vocabulary cards has 3 parts per card. Cut into pieces and match. The colored borders are a dead give away, but fun just the same!